The breakfast at Archontiko Art Hotel is handmade and personalized by the hostess, Mrs. Argyroula, welcoming the guests daily with a wide variety of local dishes. In winter the visitor enjoys breakfast in the specially designed room with the imposing fish-shaped fireplace, while on sunny days and in the summer months breakfast is served in the pebbled courtyard, against the stone-built bridge, under the shade of pomegranate and burgundy. Archontiko Art Hotel’s award-winning breakfast has the pure ingredients chosen with special care. From the farm of Grandmother Altana, fresh eggs, sweet oranges and greens, from the local dairy feta cheese, gravy, goat cheese, olive oil and olives, local thyme honey, from the bakery of the neighborhood baked bread and pastries from the traditional grocery store ” AVRA”, herbs, mountain tea, herbal teas and fresh fruits from selected producers are the main ingredients of the traditional breakfast, which alternates, reserving delicious surprises. 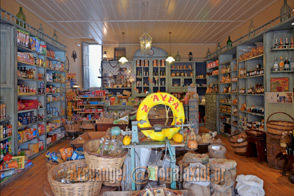 With traditional cheese pie, pumpkin pie, spinach pie guests start their day at Archontiko Art Hotel. Continue with different jams in unique combinations (apple with ginger, kiwi, orange with grapefruit, fig, carrot with apple and orange, strawberry, plum, melon and chutney of red pepper, chilli, apple and quince, as well as plum with spices) spread out on fresh bread together with butter and the famous thyme honey of the area. Local desserts, trachanas, fresh eggs that are transformed into Mediterranean omelettes (upon agreement), olive and olive paste in combination with pastries give a more salty note to breakfast. Sweets (chocolate, boletus, etc. ), rice paddy, vanilla cream, honey-yoghurt, cinnamon and orange cookies are suggested to sweeten visitors. Freshly squeezed orange juice, coffee, milk, mountain tea, herbal teas and homemade liqueurs accompany the guests throughout the breakfast. 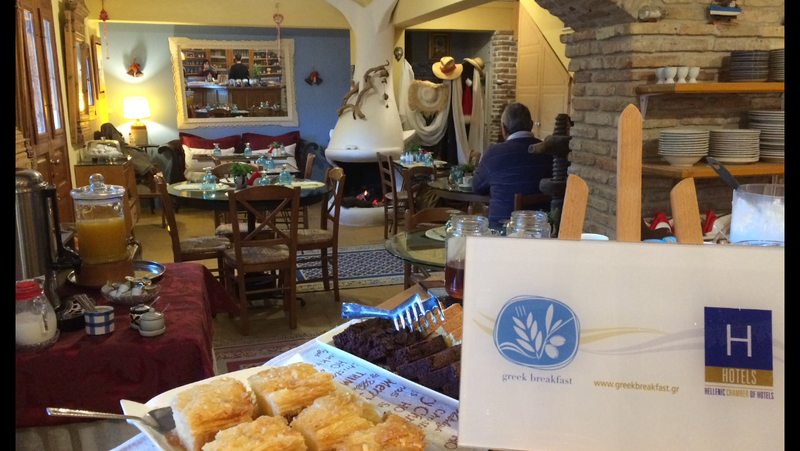 Archontiko Art Hotel’s traditional breakfast is not only a result of the owners’ view of the value of preserving tradition, but also stems from respect and appreciation to visitors who want to taste the pure products of the place.